Any time an internal body part pushes into an area where it doesn’t belong, it’s called a hernia. The hiatus is an opening in the diaphragm — the muscular wall separating the chest cavity from the abdomen. In a hiatal hernia (also called hiatus hernia) the stomach bulges up into the chest through that opening. The paraesophageal hernia is less common but is more cause for concern. The esophagus and stomach stay in their normal locations, but part of the stomach squeezes through the hiatus, landing it next to the esophagus. Although you can have this type of hernia without any symptoms, the danger is that the stomach can become “strangled,” or have its blood supply shut off. Often, people with hiatal hernia also have heartburn or acid reflux disease. Although there appears to be a link, one condition does not seem to cause the other. What Are The Causes of Hiatal Hernia? Most of the time, the cause is not known. Some people develop a hiatal hernia after sustaining an injury to that area of the body; others are born with a weakness or an especially large hiatus. Increased pressure in the abdomen from coughing, straining during bowel movements, pregnancy, and delivery, or substantial weight gain may contribute to the development of a hiatal hernia. In addition to the increased occurrence in people over fifty, hiatal hernias also occur more often in overweight people (especially women) and smokers. 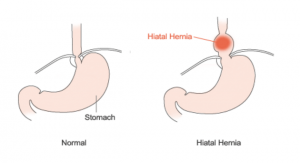 What Are The Signs And Symptoms of Hiatal Hernia? What Are The Risk Factors of Hiatal Hernia? How is Hiatal Hernia Diagnosed? A hiatal hernia can be diagnosed with a specialized X-ray study that allows visualization of the esophagus (barium swallow) or with an upper endoscopy. What Are Possible Treatments For Hiatal Hernia? Most people do not experience any symptoms of their hiatal hernia so no treatment is necessary unless there are symptoms of acid reflux disease. However, the para-esophageal hernia (when part of the stomach squeezes through the hiatus) can cause the stomach to be strangled so surgery is usually recommended.